Duncan - The Race is on! 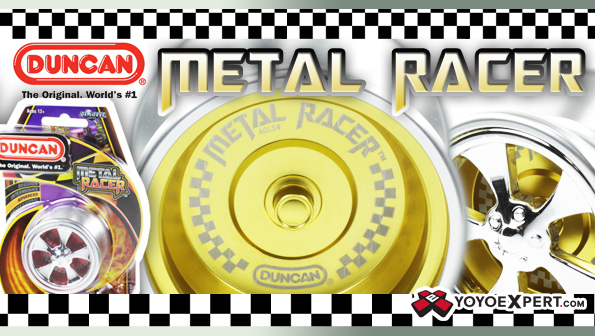 The Duncan Metal Racer is a really fun new yo-yo that combines modern performance with old school style. The aluminum Metal Racer is a responsive high-wall metal yo-yo that is just a blast to play with. It is the perfect yo-yo for a beginner who wants the solid feel of a metal yo-yo or an advanced player who loves the classic style of play. The Racer comes fitted with a size C bearing and slim pad compatible response for easy maintenance and easily removable side caps for cool customization. The Metal Racer comes responsive out of the box, but set it up with a clean bearing and a pair of shims and you've got a great unresponsive throw!